Oil on cardboard, 30 x 45 cm. 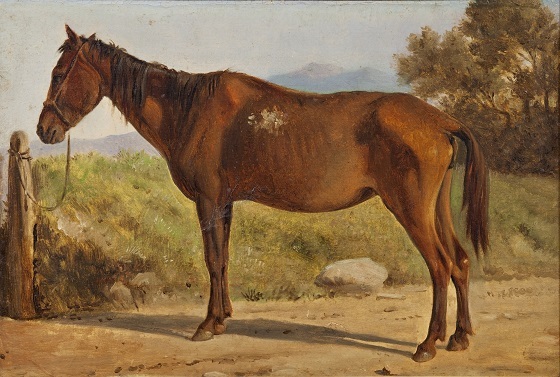 In a Mediterranean landscape stands an old and worn-out horse, tied to a pole. A majestic mountain landscape fans out across the background under a clear blue sky. Besides being an animal study, the title of this work also refers to Don Quixote’s horse, Rosinante, who like its master was worn-out, awkward and possessed a tendency to overestimate its own capacity. Marstrand often highlighted these comical traits in his depictions of the adventurous knight’s horse. Satire was not the motive in this work, however. Instead, Marstrand takes a distinctly naturalistic approach to the subject here, where everything from the horse’s muscles to its bone structure has been reproduced with great precision and accuracy.